Mod Proto's here to take us through NXT's past, present and future in today's Dev Blog. After years of internal development, 2016 saw our NXT client released into the world. In many ways, this was just the beginning. The client was built and delivered to you, but it's still very much part of our day. The great thing about working on an MMO like RuneScape is that you live with the same game that your players do every day. We use the game to test and build new content, to do events with you, and as our tool to tell the many stories of RuneScape. We work on the client every day and will do as long as you keep playing. Previously, we have talked about some of the technical challenges involved in releasing NXT. We always knew that – despite our best efforts to make a perfect client - only testing in house would fall short. That's why we looked at ways we could get your eyes on it as soon as possible. You may recall sneak previews at RuneFest and beta weekends. Using the data from these, we carefully selected what tweaks and changes we needed so that we could have a release that was stable and fully featured, but still timely. With over half a year of live play behind us I'm pretty happy with the level we launched at. Early player behaviour showed us that many people loved it, with 50% of the player base adopting the client almost immediately and never looking back. We work really hard of talking with and listening to our players. It's like having hundreds of thousands of mates in the internet, and sometimes we forget just how many players are out there and that not everyone is engaged in the conversation - they just play. That meant that a surprising number of players hadn't heard we had a new client, even months after release. Our Analytics team put together a report for me to track the uptake of the client. A red line on it showed me who was playing day by day and had never tried NXT. I'm happy to be a position now where that number is in single-digit percentage and dropping every day. We have also added a purple line representing players who have never played the Java client. Each day, thousands of players show up in game from that category. For the rest, there were those who would use the new client for regular use but go back to the Java client for specific activities. Some we could see would do a bit of play in both clients on each day most would pick a client for the day and show up on my chart as a Java user. We're now in a position that on any given day over 70% of the player base is using NXT as their only client. We've mentioned it before, but it's worth saying again: the Java client served us well but has been holding us back in several areas for a while. NXT is our ticket to be able to push the game further than ever before. Even in the halfway house where both clients are in use, we can push on with some things. You will have noticed draw distance, shadows and higher resolution textures as examples. However, there are things we would like to do with a number of systems where the difference between the two clients is too great – things we can't do while the Java client is still supported. That means that – eventually – we will need to retire the Java client entirely. There is no fixed date for this, and we don't intend to surprise you all one morning at breakfast – when it happens, you'll have notice. A day will come, though, where we have to change something that the Java client won't be able to keep up with. At that point, we want to have already made sure that we have catered to the concerns and reasons that might prevent a player from come along for the ride. As we push on in 2017 with fixes, tweaks, optimisations and improvements there are few things to look out for. It's come to our attention that somewhere in the desert there is a mysterious city. The content teams tell us there is a wealth of lore, stories and activity hidden behind the walls. We told them you can also find some new graphical features to showcase the secrets. 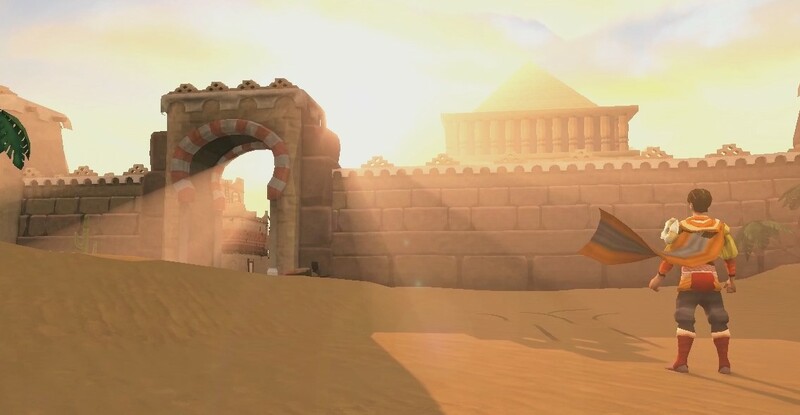 You may remember a teaser trailer offering a peek at the Golden City of Menaphos. What you might not have noticed is a stunning new lighting effect. This screenshot is a great example of our new volumetric light (sometimes called god rays). It's not just a cool thing we use in videos - it is a real-time, in-game effect that you will start seeing much more of as 2017 rolls on. The NXT team are also knee-deep in the material system, offering up tools to our artists to make a city that looks and feels better than ever before. I've been to some of the early sprint reviews and I'm getting excited already. Hopefully I won't wear myself out before the gates swing open. NXT - as a project - finished last year. However, the work never stopped, and its maintenance and ongoing development is everyday business in the team. The client is an integral part of the game that we update every week, that we work with every day and - most importantly - it's the window you adventure through every waking moment of the week. We will be tending to its many features for as long as there is a RuneScape. We will be keeping up with all the driver changes, hardware variations and operating system enhancements the world can throw out. We will be looking to improve the performance so that you can get more with less, and expand the options you can have if you have power to spare. You aren't stopping playing, so we aren't stopping working and talking. The Community Team will be watching and keep making sure that we can get your answers from the tech side. There is even a risk we might do some Dev Diary videos if you have any questions.